There are many tools available within Adwords to help you target your ads to specific customers and non-customers. We display different ads to our existing customers and potential customers using retargeting tools. Adwords makes this incredibly easy. Either by adding a pixel to your website or even uploading a list of customer emails. Something I have noticed however is the amount of irrelevant marketing sent to me by Google Adwords. 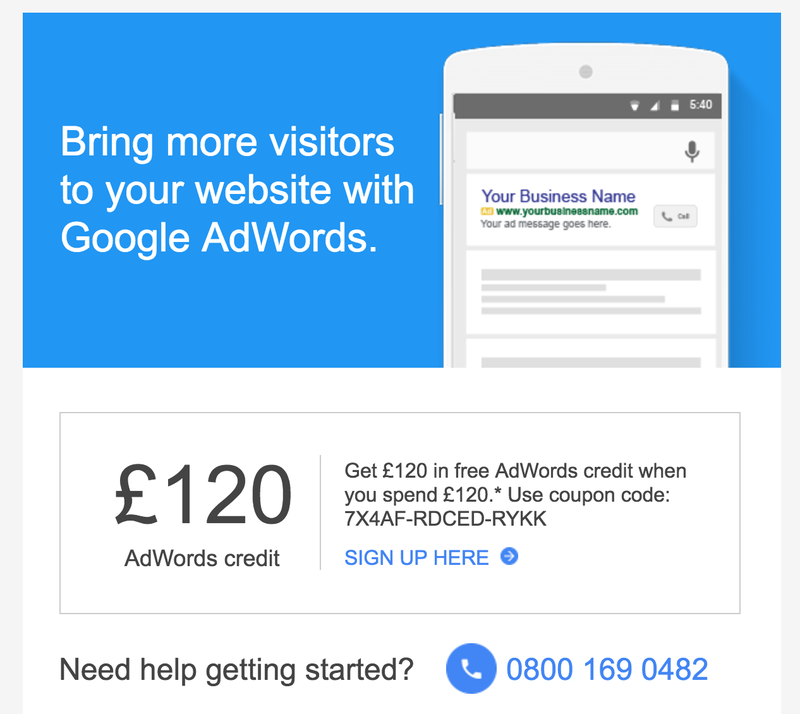 This email offers me £120.00 credit on my Adwords account. Brilliant. Except it is for brand new customers only. This email was sent to the email address registered to an Adwords account which has existed for nearly 10 years. Surely Google know how to do email segmentation? It seems not since I get one of these emails at least once a month. Next I log in to my Adwords account and do some optimisation. What happens next? Adwords starts retargeting me with a £75.00 coupon. But this is again only for brand new customers. As a small business I have the tools available to segment my retargeting list by customers and non-customers. If someone from Google Adwords needs a bit of training I can help. Perhaps the key point is Google doesn’t pay to advertise on it’s own network so it doesn’t really matter to them about wasting money advertising to the wrong segment. But it hardly shows best practice. We see Google as this great data mining machine but it seems even it is incapable of segmenting its own data.